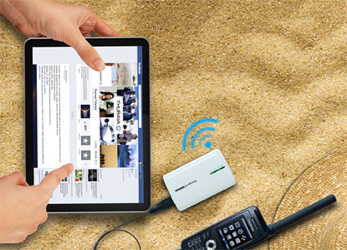 Thuraya XT-Hotspot is a pocket-size router that creates a Wi-Fi zone for multiple users to connect smartphones, laptops, and tablets to the internet over Thuraya’s mobile satellite network with data speeds of up to 60 kbps in the most remote of areas. The XT-Hotspot uses the GmPRS connection for quick and secure satellite internet access. As a result, no additional software needs to be installed. Users can switch on the hotspot and browse within seconds! It is easy, reliable and economical. USB-to-Thuraya data cable is required for use, it is supplied with the XT phone kit.